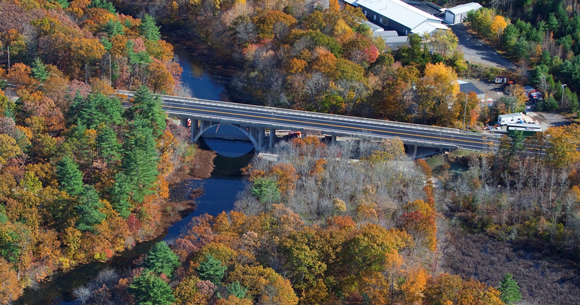 Rhode Island DOT saved commuters potentially years of detours and delays while also saving more than $100,000 upon completion of its Stillwater Viaduct Bridge Rehabilitation project. This $9.4 million project replaced the 80-year-old Route 116 Stillwater Viaduct Bridge in Smithfield, which serves as a key link between Route 104 and the area’s “corporate corridor.” The bridge had been identified by RIDOT as “severely deteriorated,” losing its structural integrity, so it was included in the state’s Comprehensive Bridge Improvement Program for some much-needed attention. Instead of constructing the replacement bridge in phases, which could take up to three years to complete, RIDOT and contractor Northern Construction Services closed the bridge to traffic to expedite the process. They also used precast components whenever they could to keep the project moving at a quick pace. Their efforts led to a seven-month construction period, with the bridge opening five weeks ahead of schedule and saving about $110,000 through that early completion.